This review of the Tesla Powerwall 2 will analyse the hottest solar storage product on the market this year. Powerwall 2 blasted onto Australian shores in 2017 after Tesla engineered new improvements based on the feedback of Powerwall 1’s early adopters. Powerwall 2 hosts a number of collective improvements, some small, and some large. Ultimately Tesla have delivered an enhanced product that is now gaining mainstream traction. Powerwall 2 boasts a greater storage capacity of 13.5kWh, over double the original with no substantial price hike. It also has an impressive 5kW continuous output with a 7kW peak, far superior to the 3.3kW of the last model. The higher capacity is better suited to realistic household loads. Powerwall 2 uses liquid cooling and has a rated operating temperature range of -20-50 degrees, but at the greater extremes, you will have a reduced output due to the nature of the chemical composition of the battery technology. The exterior design is stylish & modern, while serving a practical function as seen by the cooling vents on either side. Overall the new design reflects a sleek and functional upgrade that houses the new additions brilliantly. Powerwall 2 can be both ground mounted and wall mounted and weighs in at 120kg. Lithium Ion technology has proven to be inherently safe, but due to Australian regulations Powerwall 2 must be installed in a non-liveable area of the home. The permissible areas for installation therefore include enclosed or sheltered garages, or alternatively an outdoor installation on the side a house is viable thanks to an IP56 weather rating. An example of a non permissible area would be the laundry, as it is still considered a liveable area of the house. As a rule of thumb, if it’s inside and not the garage, it cannot be installed there. Once Powerwall 2 is installed, you are given the freedom to choose how much storage capacity you would like to reserve in the event of a blackout (keep the lights on when the grid’s down!). Typically this is set at around 20%. 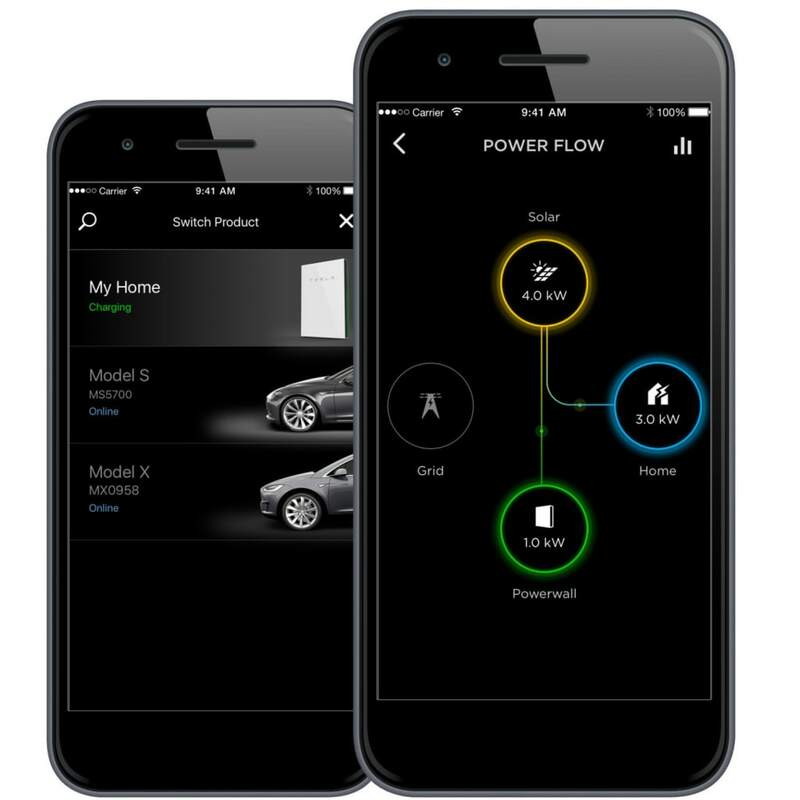 This functionality is controlled through the Tesla app, which allows you to monitor your live electricity consumption, and control when you charge and discharge your Powerwall 2. The app is available on IOS and Android, and has an interface users will find easy to nativage. Powerwall 2 is easily one of the best value storage solutions on the market per kWh. A large storage capacity of 13.5kWh allows Powerwall 2 to provide a steady stream of power to your home, with the real potential to eliminate your bill completely if your usage falls within these limits. Powerwall 2 is backed by a 10 year warranty, giving households the peace of mind that your Powerwall will stand the test of time. Should I Buy A Powerwall 2? Electricity prices are on the rise and the reliability of the grid has been front page news this year. Sydneysiders are taking matters into their own hands and installing battery storage in record numbers to protect their household from the risk of a grid down scenario. The price of a Powerwall 2 is between $12,000-$13,000, full installed, with the inherent benefits of Powerwall 2 giving you the potential to save tens of thousands of dollars on your electricity bills over the life of the product. Overall, the consensus is that Powerwall 2 is one of the best solar storage solutions on the Australian market, providing energy security, independence from the grid, significant savings on your power bill and the ability to divest from coal by running your home on solar power up to 24 hours a day.